Alpine Lodge is brand new built in 2018. Nestled in the trees on 10 secluded acres overlooking the entire Leavenworth valley and panoramic views of the Cascade Mountains. It is simply a quiet piece of heaven. Nothing to hear but the wind in the trees and the chirping of the birds. And just 1.5 miles from downtown Leavenworth. 4 x 4 VEHICLES ARE REQUIRED TO GET TO LODGE IN DECEMBER - FEBRUARY. Alpine Lodge is a two story building built and designed for your comfort. It has central Heating and Air Conditioning, High Speed Fiber Internet, Cable TV, and DVD Library. The first floor has a three car garage to park out of the heat or cold, or just to help keep your car clean. The first floor also has two bedrooms. Each have a Queen and a Bunk Bed, and a shared bathroom between them. There is also a laundry room with quiet front load washer & dryer on the first floor. On the second floor there is a Master Suite with a King Bed, Walk-in Closet, 43" Smart LED TV, and Private Bath with Two Person Soaker tub and Walk-in Shower. Also, on the second floor is another Guest Suite with a King Bed, Walk-in Closet, 43" Smart LED TV, and Bathroom with Tub/Shower. Also on the second floor is a covered deck for dining or viewing the entire Leavenworth Valley and the majestic Cascade Mountains. We live in the Leavenworth Valley, and are just 10 minutes away if our guests need any assistance. Our surrounding neighbors are on 10, 20, or 100 acres, so the Lodge has plenty of privacy and silence. The landscape surrounding the Lodge is lightly wooded with a carpet of wild flowers in the spring, wild rose bushes blooming in the summer, and bright fall colors in the fall. We just finished building Alpine Lodge in 2018. It is designed for family and friends to gather and enjoy each others company in the privacy of their own home in a peaceful environment since there are no neighbors around the Lodge. Please enjoy your own place and privacy. Organic Whole Bean Coffee, Assorted Teas, Sugar, Assorted Spices. Alpine Lodge was a wonderful getaway for the 2 families in our party. We had a large group (4 adults and 8 kids) and we had plenty of space. The house is beautiful and was very clean. The location is excellent. 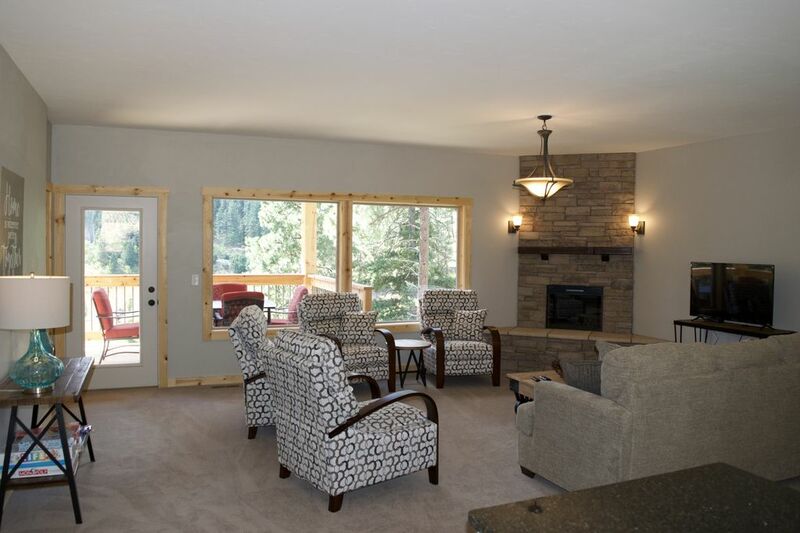 Plenty of privacy up in the hills, but only a few minutes from downtown Leavenworth. The beds are very comfortable. We all slept well. We wouldn't hesitate to stay there again. Alpine Lodge was great! Private, yet close to town. Just what we needed for a family get-away! We are so happy you enjoyed a wonderful and relaxing weekend at the Alpine Lodge! Thank you for being such great guests, and hope to see you again! The Alpine Lodge is a wonderful house and is very comfortable. It is a great layout for 2 families to enjoy. The kitchen has just about anything you would need. The owners are very responsive and easy to get a hold of when we had questions. The location is great as it is less then 10 minutes from town, but you feel as though you are out in the country. If you are visiting in the winter, make sure you have a 4WD vehicle with low gear. If you suspect any ice, be sure to bring chains. We have a 4WD Sequoia and had trouble getting up and down (we did not have chains). Bill was very helpful in coming out to spread sand and gravel for us. We are so happy you enjoyed your stay. We find that since the Alpine Lodge sits on 10 acres with no close neighbors, it is a quiet sanctuary with an amazing view! We did have a very rare ice storm that morning, which in normal snow conditions the road is easily traveled with 4 wheel drive. So, with the ice it made it very slick. First time we had to put sand down. Beautiful setting and home. We had plenty of room for all of us. Alpine Lodge was everything and more that we hoped for. Our visit was during Thanksgiving weekend and our entire family was delighted to walk in and see a beautifully decorated and lighted Christmas tree and gorgeous wreath on the fireplace. The lodge is equipped with everything that we needed and the furniture and beds were quite comfortable. There was snow and ice on the private drive up to the lodge but we did have four-wheel-drive and all weather tires on our suburban so we made it up and down multiple times with no problem. However, my niece’s smaller car with older tires, even though It did have all wheel drive, did have some difficulty and so remained parked in the cul-de-sac during the weekend. All in all it was a wonderful getaway in a beautiful home! Thank you Bill and Paula! We are delighted you enjoyed your weekend and everything the Alpine Lodge has to offer. We strive to make the Lodge as comfortable and relaxing as possible. Wow! What a beautiful spot. We loved how secluded and quiet this spot was, in the middle of all of the fall leaves. But a 6 minute drive to Leavenworth. The house is impeccable, everything is brand new, beds were super comfy. All of the rooms are large too, so we weren't tripping over our suitcases. The main living area is much bigger than it looked like in photos and was great for playing board games and hanging out as a group. We just loved everything about our stay. When we had questions, Bill was quick to text or pick up the phone and was super kind and courteous. We'll be back! We are so happy you enjoyed your stay at the Alpine Lodge, and all it has to offer. It is a wonderful and relaxing place to be. We built the Lodge with our guests in mind to be as comfortable and enjoyable as possible. The Amtrak train station is only 1/8 mile away. There is a taxi service that waits to pick you up when the train arrives to bring you to the Lodge, just up the hill. The Leavenworth Taxi as well as Uber will help you get to town and surrounding activities. During OctoberFest weekends, there is a free shuttle that will pick you up and drop you off at the bottom of Fox Rd.